There is significantly less gossip value to this morning’s post, but bear with me. As you may have been able to tell from my last post, yesterday started out confusing, frustrating, and a little bit alienating. The early afternoon didn’t get any better – I got rained on while coming back from a trip to Walgreens empty-handed, and all I could think about was how comfortable it would have been to run right then. Being injured really gets you down sometimes, especially when you’re almost 2000 miles away from all the people who normally take your mind off the subject, or the mountains you’d hike to get in a workout and feel simultaneously accomplished and at peace. 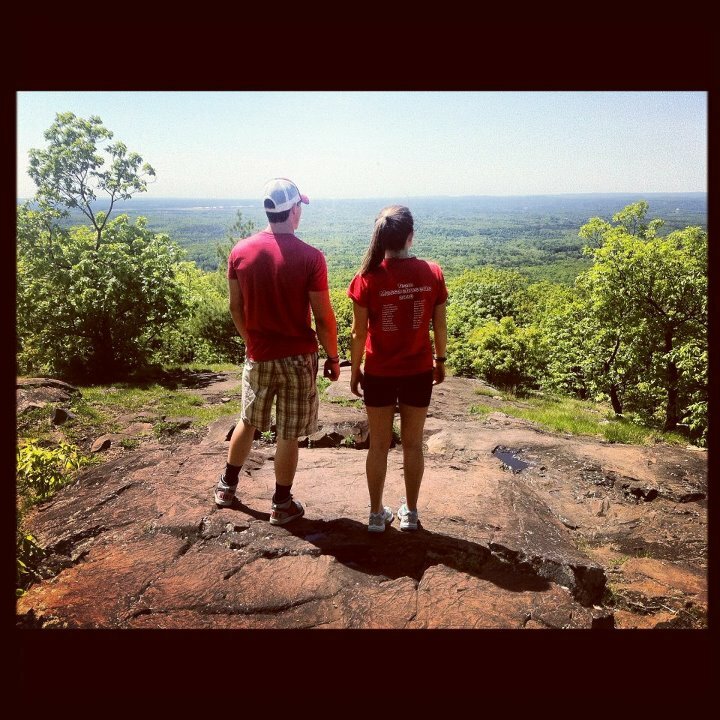 There is nothing like standing atop a mountain and looking out over the places where you’ve lived, the place that shaped the person you are today. For me, there are several of these mountains: Greylock in the Berkshires gives a view of the places I grew up skiing every weekend, sucking up the below-zero temperatures to participate in my favorite sport; the Holyoke range in South Hadley, which overlooks Amherst, Hadley, Sunderland, Leverett and other towns where I went to college, learned to push myself harder than before, and logged more miles than I ever thought I would, all by myself, because I knew I could. 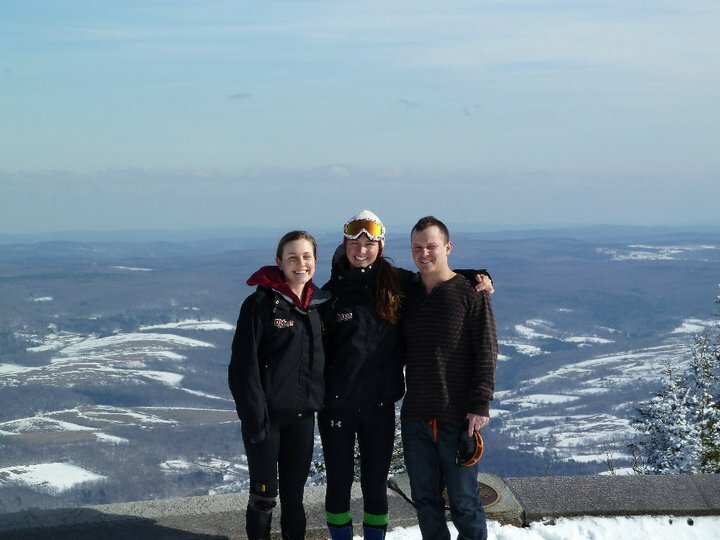 Atop Mount Greylock with Sophia and Cameron before skiing Thunderbolt trail, March ’11. I guess this is what you would call homesickness, which is something that I have never admitted to, so I determined an alternate diagnosis: lack of chocolate. Why had I not realized this sooner? I know, I’m a nutrition person, I’m not supposed to have an addiction like that. You’d be surprised how many of us do. So, after being rained on during my fruitless Walgreens trip, I loaded up the car and headed to Rouses, deciding I could stand to purchase not only tacks and nail polish, but some avocados and bananas in preparation for James’ arrival, and some hot chocolate mix to cure my Wednesday morning blues. You will probably be surprised to learn that there is not as great a selection of hot chocolate in Louisiana in comparison to Massachusetts, but I made it work. I picked up a box of single-serving pouches of some random value brand of sugarfree hot chocolate, which I like because it doesn’t have that overwhelming fake taste that you get a lot with artificial sweetener. In my opinion, hot chocolate is one of the best ways to satisfy a chocolate craving – I am often unable to finish the whole mug because of the richness! I almost bought a bag of cool looking homemade marshmallows from Sucre, then I realized they were $7. Thanks, but no thanks. I’ll come back to sample your blackberry-lemon macaroons later. Maybe it was satisfying my craving, or maybe it was the fact that I got to eat dinner at Alysse’s house last night, but the morning’s blues were cured! Today, I’m off to Hour Blast for the fourth day in a row (fingers crossed for my shins! ), then back here to shower and change, then THE AIRPORT!! I am so excited. Plans for the rest of the day include tacos and the Patriots vs Saints game (may go for neutral clothing) at the Rum House. Can’t wait! It’s highly likely that my blogging frequency will decrease significantly while James is here, but I’ll have plenty of restaurant and other adventures to discuss, as well as my first classes teaching at Hour Blast once I get back! Have a great weekend, if I’m not around to wish you one later!